preparation, known as Naivedya and distributed to devotees as prasadam. Scientists call Arudra "mysterious" and "elusive" in their published works, informally calling this massive orb "the dancing star." 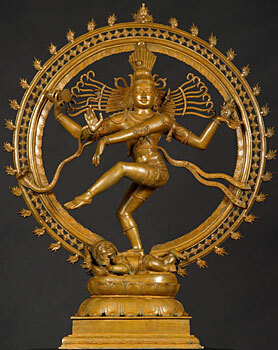 Lord Shiva's cosmic dance is represented as `Nadaraja' (Lord of dance). The cosmic dance is known as dance of bliss (Anandha Thandavam). Lord Shiva performs five most important functions to keep the world alive. They include creation, protection, destruction, embodiment and saving with grace. Lord Nadaraja's cosmic dance pose represents all these five activities – the hourglass shaped drum held in his upper right hand by the Lord represents the function `creation'; the second right hand gesture symbolising `fear not' represents `protection'; the fire held in the upper left hand represents `destruction'; the second left hand points towards raised foot signifies liberation from successive birth; the foot planted on the earth represents Lord's `embodiment' function; and finally the foot held aloft also symbolises the `grace'. The dwarf demon lies at the bottom of the planted foot signifies ignorance. The flames surrounding the lord represent the universe. The snake found around the Lord's waist signifies yogic energy (kundalini or pranasakti). 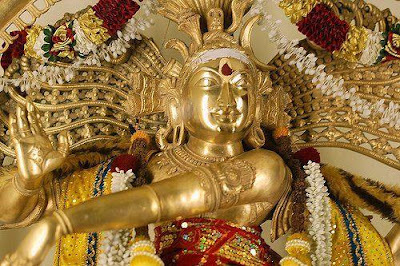 The cosmic dance form of Lord Nadaraja represents the continuous cycle of creation of soul, protection of soul, destruction of soul, embodiment of soul and liberation of the soul from successive birth. Lord Nadaraja dances with his consort Devi Sivakami. 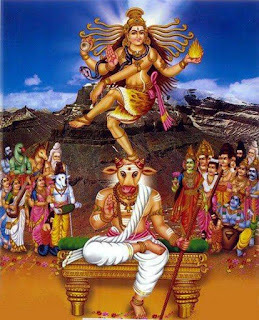 In fact the Lord derives energy from his consort Shakti. ( Shakti means energy). From puranas we learn that on this holy day Lord Shiva has performed this blissful cosmic dance in front of his two ardent devotees - Vyagrapadha and Adhisesha (Lord Adhisesha is the five headed serpent on whose body Lord Vishnu lays down). The subjects of Lord Shiva also witnessed this dance. They wanted to celebrate this day as `Arudhra Darisanam' or cosmic dance of Lord Nadaraja. They wanted to seek the grace of the Lord for protecting the cosmos with his grace. The destruction is a part of evolution. Every day we sleep or die to wake up fresh. The ‘shivam’ or the intelligence of God inside us takes care of the need to destroy cells so that new ones are born. In all Shiva temples there will be sanctum sanctorum for Lord Nadaraja. There will be abhishekam (bathing the prime deity) and pooja for six times in a day in very temples. On the day of Arudhra Darshan there will abhishekam and pooja on the early morning of the full moon night. The holy shrine Chidambaram (located in Cuddalore district, Tamil Nadu) is considered as foremost important from Saivites point of view. The prime deity is Lord Nadaraja and his consort Devi Sivakami. 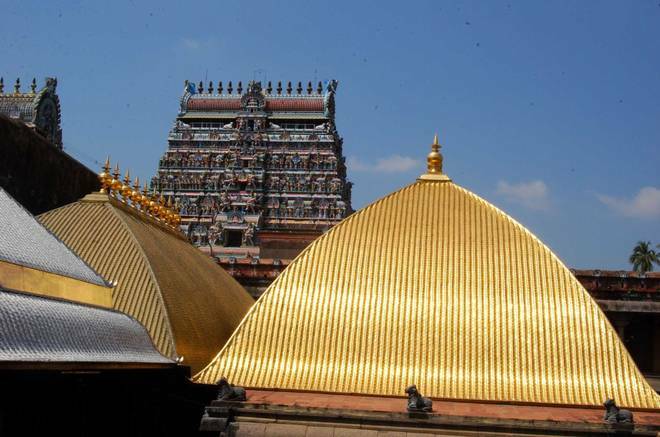 The temple's annual festival Margazhi Bhramotsavamwill be celebrated for ten days. It is one of the very important festivals. On this holy day at Chidambaram more than two lakh devotees will congregate to witness tenthday events of Arudhra Darshan, the most important festival. The holy abhishekam and pooja will be performed and the Lord and His consort will be taken as procession. During the procession the devotees (oothuvar) will recite the devotional holy hymns from "Thevaram", "Thiruvasagam" and "Thiruvempavai". ancient temple where Lord Nadaraja is the presiding deity is located in Chidambaram and the unique feature of that temple is the famus "Chidambaram Raghasiam" ( Cosmic Secrets) . The mental activity is started by the dance of syllables or vowels and consonants, 51 in number. And these representatives, 51 sounds or alphabets are displayed to you in the sanctum sanctorum of the temple that the central piece is the dancing Shiva. And his one side is the goddess and the other side is a screen, a curtain and behind the curtain they place this 51 alphabets that are responsible for originating consciousness. So during the services they remove the curtain and ask you this is the secret of Chidambaram (Chidambara rahasyam). They won't explain it to you what it is but there are only 51 golden bilwa leaves which are inscribed the sounds that go to compose consciousness. The idea is if you understand consciousness hidden in the alphabets then you have understood how the world is organized. In the deodar forest lived sages who had spent their lives studying the cosmos, seeking the supreme truth. As time passed the sages deluded themselves with self-importance and their heads swelled with pride. They claimed they had renounced the world but secretly they sought all the pleasures of a life of luxury. They preached renunciation but practiced every from of sensual indulgence. To teach the sages a lesson Shiva arrived in the form of a handsome young hermit. Seduced by his beauty the sages and their wives ran after him. The sages held Shiva responsible for their own lack of restraint. They decided to destroy this temptation. With their magic powers they created a tiger, a serpent and a goblin and set them upon Shiva. Shiva skinned the tiger alive, wore the serpent around his neck and laughing, jumped on the goblin and began dancing on his back. This stunned the sages. He continued to dance wildly issuing tremors throughout the world, shaking the heavens and splitting the mountains. The gods abandoned the heavens to see the dance. As Shiva danced the sages realized that Shiva had flayed the tiger of their ambition, tamed the serpent of their passion and crushed the goblin of their ego. His dance captured the rhythm of life, the cosmic cycle of generation, organization and destruction. It encapsulated the essence of cosmic truth or santana dharma. In his hands Shiva as Lord Nadaraja holds a drum that makes the final sound of death as well as the primeval vibrations of life. In his left hand Nadaraja holds Agni, a fire that burns and destroys yet also illuminates and energizes. Around him is a fiery prahabhamandala, which is the great wheel of samsara filled with the infinite cycle of births and rebirths. The sages looked at Shiva in awe. He came be known as Shiva Nadaraja the lord of Dance. Arudra is the star that names one of the 27 lunar mansions of Hindu astrology. It is known as Shiva's star, a cosmic representation of His third eyes, red and intense. Called Betelgeuse in the West (a medieval Arabic name), it fascinates and consternates modern astronomers. Though it is one of the most studied of suns, it defies description, as it changes in brightness, size and even shape with rythmic gusto. Scientists call Arudra "mysterious" and "elusive" in their published works, informally calling this massive orb "the dancing star." Hindus might find the name apt - after all, Siva is Nataraja, King of Dance. Arudra is part of the constelation of Orion, shinning as the brightest red star in the sky. Because of its blazing choreography, there is no certainty about the latest calculations point to around 600 light-years. Siva's star is colosal. For sake of camparison, if it were the size a football stadium, Earth would be a spec of dust, and the Sun no larger than a mango. Arudra is nearing a transitional point in its evolution. Tomorrow, perhaps, or several thousand years from now - it will enter a supernova stage. In that act, marking the height of his cosmic performance, Arudra will convert most of itself into light and cosmic rays, sending its energy out to the universe in a blinding flash. When it will outshine the full moon in our sky for months and be visible even during the day. After that, Arudra will be a small neutron star, unimaginably dense, spinning incredibly fast. Just a cup of matter from a neutron star's core weighs more than all the mountains of the Himalas combined. Mantra to chant at the time of the birth of Shiva during the Arudra Darshan day is Om / Hmmm SiVaYaNaMa to help you to get rid of your old consciousness and establish a divine consciousness.